Sick and tired of packing yourself into a sardine can subway car every morning to get to work? If you live in Brooklyn or Queens and commute to Manhattan, things could be looking up for you very soon. This morning, Dan Levy, president and CEO of CityRealty, presented his vision for a faster, better - and heck, even pleasant - trip to work. Called the East River Skyway, the proposed gondola system would be able to shuttle commuters over the East River in just four minutes, all without having to build another costly and time-consuming underground subway line. North Brooklyn is already serviced by subways (the G and the L), buses, taxis and ferries. Why do we need the East River Skyway? If you live on the L line, you’ve probably experienced this ridership growth (and the discomfort that comes with it) firsthand. Some have proposed additional subway lines but, as we’ve seen in the past, new train lines can be extremely costly and can take decades to complete. More ferries could be another answer but limit commuters who need to get further inland since they obviously can only travel on water. The East River Skyway proposes an alternative option that would be cheaper to build than a new subway line and that would also be able to transport people several avenues inland. Levy explained that his vision would also be zero-emissions since it would be powered by electricity, 3x safer than bus or rail, super-efficient (able to move 5,000+ people per hour in both directions), and faster than other current methods of travel (4 minutes one-way from Williamsburg to Manhattan). Queens residents could benefit as well if the project comes to fruition. Although the first phase of the Skyway would only connect Williamsburg with Lower Manhattan, a second phase could link Williamsburg to Greenpoint, Long Island City, Roosevelt Avenue and Midtown Manhattan. 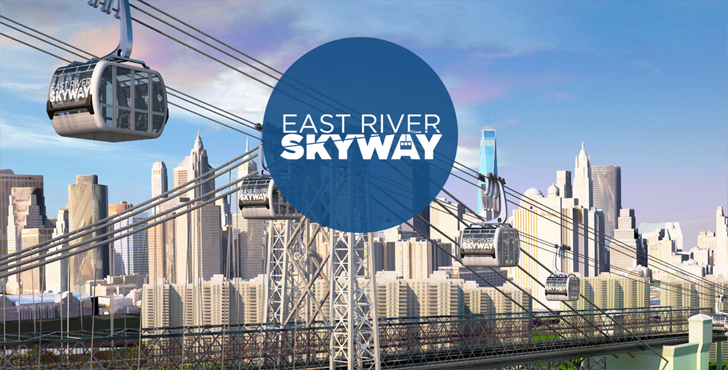 Want to help make the East River Skyway a reality? Sign up for updates to the project here. Travel time across the East River is not the crux of the matter. The numbers of passengers per hour (Translates into people per gondola) and then what happens at disembarking. Where do the commuters go from there to complete their commute. The subway is a complete system. Gondalas are not. According to CityRealty's blog 6sqft: "Before the L train added an extra ninety-eight weekly round trips in 2012, trains were filled to 116 percent of their stated capacity—that’s about 1,345 people per train, with some cars packing in 32% more than the maximum. Fast forward to 2014, the MTA reports that ridership is at an all-time high, and the L line has had the largest percentage increase in the entire system (5.3% or more than 6,000 riders per weekday over the year). Ridership increased at every station on the line, including an 8.1% increase at the Bedford Avenue station. Weekday numbers have increased at Bedford Avenue alone by more than 50% since 2007. Additional cars were introduced this June accommodate new riders, but if you’re a daily L rider, especially one that hails from Brooklyn, the difference has been negligible." If you live on the L line, you've probably experienced this ridership growth (and the discomfort that comes with it) firsthand. Some have proposed additional subway lines but, as we've seen in the past, new train lines can be extremely costly and can take decades to complete. More ferries could be another answer but limit commuters who need to get further inland since they obviously can only travel on water. Queens residents could benefit as well if the project comes to fruition. Although the first phase of the Skyway would only connect Williamsburg with Lower Manhattan, a second phase could link Williamsburg to Greenpoint, Long Island City, Roosevelt Avenue and Midtown Manhattan.